Welcome to The Abso!ute Sound online! We explore music and the reproduction of music in the home. We believe that the sound of music, unamplified, occurring in a real space is a philosophic absolute against which we may judge the performance of devices designed to reproduce music. Our goal is to provide the resources consumers need to judge how a component's sound either honors or departs from the music's truth, and to make sound purchasing decisions that maximize their experience of reproduced sound. Below is our Issue 144, October / November 2003 table of contents and editorial. Roksan's Radius 5, Thorens' TD850, and Nottingham's Horizon. From our third issue, HP's groundbreaking review of the Audio Research SP-3 preamp, the product that launched a tube revival, with a contemporary comment from HP. Our second annual assemblage of the very best products reviewed in these pages. Alan Taffel listens to the Acura/ELS's breakthrough DVD-A Auto Sound System. Baby indeed! Wayne Garcia listens to this tiny, good sounding, and inexpensive tube amplifier — and she's cute too. Chris Martens gives you the lowdown on 9 — yes 9! — ways to improve your AC power. Robert Harley likes what he hears from Ayre's tasty new integrated amp. 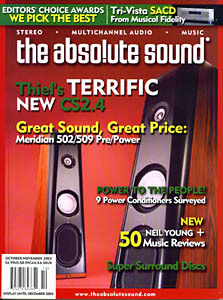 Thiel's latest floorstander gets a workout from our man in Studio City, Neil Gader. "Just right" is how Sue Kraft describes this mid-priced pair from Meridian. and tells you how to save a few bucks, too. No AC = very quiet LP playback. Wayne Garcia on the latest from the mind of Ron Sutherland. The company's name describes the player, according to Shane Buettner. Nicholas Bedworth checks out Linn's 21st Century music box. Paul Seydor takes an in-depth look at these gorgeously built and ultra-pricey components. HP on the current state of multichannel sound. New records from The Mars Volta, Café Tacuba, Tomahawk, Mondo Generator, EELS, Northern State, and various '60s surf-rock "legends." 184 - Neil Gader reminisces on the early days of his lifelong love affair with audio.